Business Tip #2: Keep It Simple Stupid (KISS). Mission accomplished with Destroyer as ascetic musings are nowhere in sight. Detroit Rock City makes for a great opener (and inspired an underrated teen comedy namesake) and the brain is rarely tested the rest of the way. 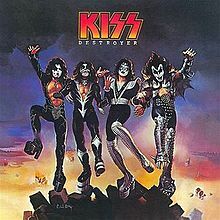 This hedonistic playground of an album was also the perfect distraction as Kiss managed to trick the masses into believing they were stupid. Behind the makeup, enormous tongue, and blood, there is quite a bit of business saavy. Hardest job in the world: being a mother? European soccer referee? Try being a Kiss completist, attempting to purchase the entire collection of Kiss collectibles. Note also that the band doesn’t merely have fans, they have the unwavering loyalty of The Kiss Army. Even though few would argue that Kiss has topped this album in the 36 years since its release, that certainly hasn’t stopped Gene Simmons from having quite a lucrative 2nd career as a reality TV star. He seemingly puts his name on anything, yet the Simmons brand doesn’t appear to diminish in value. Destroyer reveals none of this business acumen and it’s probably just as well.